Add dimension and light to your room with an eye-catching mirror. 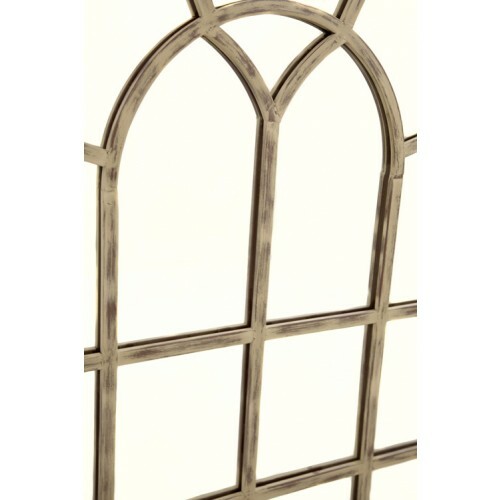 This wonderfully unique Arch window Mirror cannot help but draw attention to itself with great shape and bold steel framework. It is divided with steel mullions to make the mirror appear like a window. It looks great on its own or set as a pair to really give the illusion of windows. The beauty and character of this mirror makes it a welcome addition to any living space, light is drawn in to your room and an illusion of space is created. 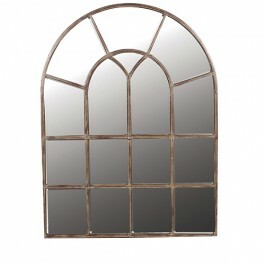 Make an exciting statement with a stunning Arched Window Mirror. I ordered the mirror and was quickly contacted to arrange a delivery time and date. The delivery people phoned before they arrived so no need to wait in all afternoon! The mirror is fantastic quality and makes my hall look much lighter and spacious. I would recommend this company and mirror to anybody. It was Pauline's review that clinched the decision for me, and I took a deep breath and ordered not ONE but TWO of these arched window mirrors, and I am SO thrilled with them, I really am. I've had favourable comments from everyone who has seen them and they really do enhance my cottage beautifully. I had to wait 6 weeks for them to come (from China!) and was getting decidedly anxious about the whole thing as, having paid in full in advance, I then heard nothing at all about any delivery date or time. Then, out of the blue, at 6.30 p.m. the driver rang on his mobile, said he was in Southampton, and could he deliver them that evening? He arrived about an hour later and it was helpful in unloading them, as they are big and heavy. I'm now a very satisfied customer.